COMPOTOOL BoxPreg is a high temperature Benzoxazine tooling prepreg for high production tooling. 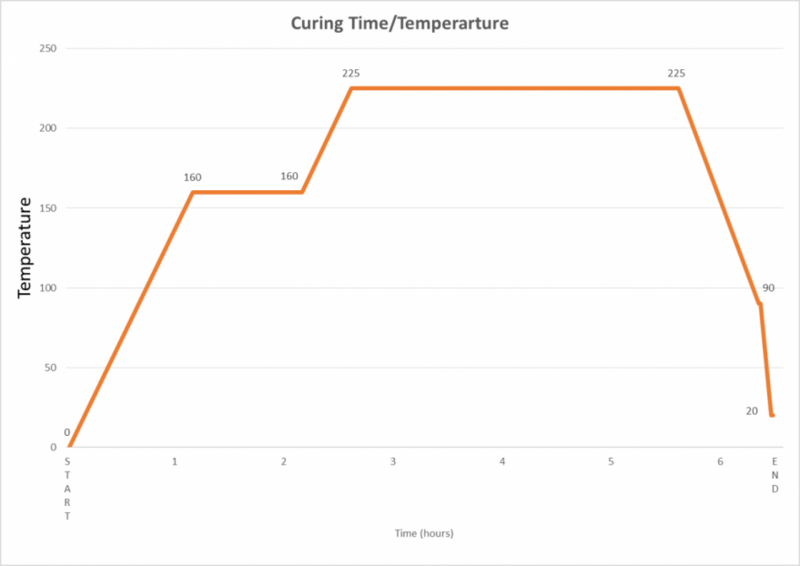 BoxPreg can be cured on the COMPOTOOL board at 225°C (435ºF) with a fast single cure cycle reducing demand on autoclave time. BoxPreg in combination with COMPOTOOL tooling boards significantly reduce tooling production time and costs. BoxPreg offers superior handling characteristics and 6 months working life at room temperature. High accuracy composite tooling can be produced in hours. 6 months out life at room temperature (≤25°C/75ºF). 24 months storage at -18°C (-40ºF). 260°C (500ºF) TG ideal for high production tooling. Low shrinkage for improved dimensional tolerance. Full cure on Compotool master model eliminating post cure off the master model distortion. Apply full vacuum at 0.97 Bar (14 Psi). Apply 6.2 Bar (90 Psi) autoclave pressure then vent to atmosphere when pressure exceeds 1 Bar (14.5 Psi). Ramp the laminate temperature up at a rate of 1~3ºC (4~5ºF) per minute until the lagging thermocouple reaches a temperature of 160 ±3ºC (320 ±37ºF). Dwell at 160 ±3ºC (320 ±5~ºF) for 60 minutes. Ramp the laminate temperature up at a rate of 1~3ºC (4~5ºF) per minute until the lagging thermocouple reaches a temperature of 225º ±3ºC (437º ±37ºF). Dwell at 225º ±3ºC (437º ±5ºF) for 3 hours. Cool to below 90ºC (194ºF) at a rate of 3ºC (5ºF) per minute before dumping pressure and removing from the autoclave. For alternate cure cycles please contact your local Compotool representative. COMPOTOOL BoxPreg should be stored in protected area. Can be stored at room temperature for less than 6 months if the materials will be stored longer then keep below -18º (0ºF). Compotool BoxPreg is available in 1.27 meter (50 Inch) wide rolls or in 423 x 423mm (16.6 x 16.6 Inch) squares. For other custom sizes please contact your local Compotool representative.